1. Stir milk and sugar in a saucepan over low heat until lukewarm. Turn off heat. Stir in yeast, and stand on stovetop for 10 minutes or until mixture is foamy. 2. 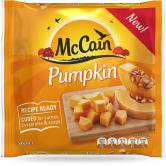 Cook McCain Diced Pumpkin as per packet instructions, mash and drain well to remove all moisture. You want to ensure the puree is as dry as possible so that the buns do not have excess liquid in them. Pureed pumpkin adds moisture and a great flavour twist on the Easter classic. 3. Sift flour, spices and salt into a bowl. Stir in McCain Diced Pumpkin puree, sultanas, yeast mixture, egg and butter and stir until mixture forms a dough. Knead on a floured surface for 5 minutes or until smooth and elastic. Place in a lightly oiled bowl and cover with plastic wrap. Set aside in a warm, draught-free place for 1 hour, or until the dough doubles in size. 4. Punch dough down to its original size, knead for 30 seconds on a lightly floured surface until smooth. Divide dough into 16 even pieces and shape into balls. Place balls on a greased or lined baking sheet 1cm apart. Cover with plastic wrap and stand in a warm place for 30 minutes or until the dough has risen. 5. Preheat a fan-forced oven to 190°C. Make flour paste by stirring remaining flour, 1 tablespoon sugar and 1/4 cup water together, adding a little more water if the paste is too thick. Spoon the mixture into a small snap-lock bag. Snip off 1 corner of bag. Pipe flour paste over tops of buns to form crosses. Bake buns for 10 minutes then reduce oven to 180°C and bake for 15-20 minutes or until golden and risen. Turn onto a wire rack to cool. 6. Make sugar glaze by stirring remaining 1/3 cup sugar and 2 tablespoons water in a saucepan over low-medium heat until sugar dissolves then bring to the boil for 3-4 minutes, do not stir once boiling. Brush hot syrup over top of buns. Serve warm or at room temperature. 1 Stir milk and sugar in a saucepan over low heat until lukewarm. Turn off heat. Stir in yeast, and stand on stovetop for 10 minutes or until mixture is foamy. 2 Cook McCain Diced Pumpkin as per packet instructions, mash and drain well to remove all moisture. You want to ensure the puree is as dry as possible so that the buns do not have excess liquid in them. Pureed pumpkin adds moisture and a great flavour twist on the Easter classic. 3 Sift flour, spices and salt into a bowl. 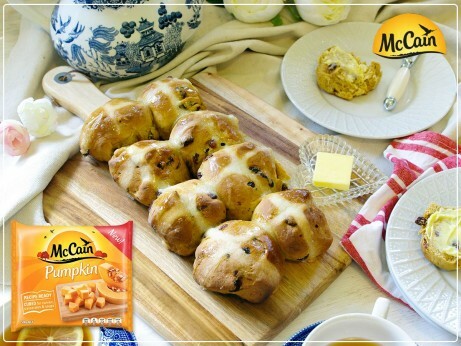 Stir in McCain Diced Pumpkin puree, sultanas, yeast mixture, egg and butter and stir until mixture forms a dough. Knead on a floured surface for 5 minutes or until smooth and elastic. Place in a lightly oiled bowl and cover with plastic wrap. Set aside in a warm, draught-free place for 1 hour, or until the dough doubles in size. 4 Punch dough down to its original size, knead for 30 seconds on a lightly floured surface until smooth. Divide dough into 16 even pieces and shape into balls. Place balls on a greased or lined baking sheet 1cm apart. Cover with plastic wrap and stand in a warm place for 30 minutes or until the dough has risen. 5 Preheat a fan-forced oven to 190°C. Make flour paste by stirring remaining flour, 1 tablespoon sugar and 1/4 cup water together, adding a little more water if the paste is too thick. Spoon the mixture into a small snap-lock bag. Snip off 1 corner of bag. Pipe flour paste over tops of buns to form crosses. Bake buns for 10 minutes then reduce oven to 180°C and bake for 15-20 minutes or until golden and risen. Turn onto a wire rack to cool. 6 Make sugar glaze by stirring remaining 1/3 cup sugar and 2 tablespoons water in a saucepan over low-medium heat until sugar dissolves then bring to the boil for 3-4 minutes, do not stir once boiling. Brush hot syrup over top of buns. Serve warm or at room temperature.